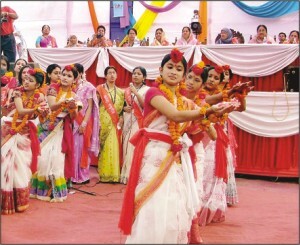 A two-day programme marking the 100th founding anniversary of Dr Khastagir Girls' High School, the first academic institution for girls in Chittagong, began yesterday amid enthusiasm and festivity. Headmistress of the school Hasmat Jahan and Chairman of Chittagong Board Prof Md Yusuf inaugurated the programme through hoisting the national and school flags at around 10:00am. Former adviser to the caretaker government Dr Sufia Rahman, also a former student of the school, was present at the inaugural ceremony as the chief guest. Hasmat Jahan chaired the inaugural ceremony while Satabarsha Udjapan Parishad President Surma Chowdhury delivered the address of welcome. Country's first female Brigadier General Dr Suraiya Rahman, Deputy Secretary of Land Ministry Afroza Moazzem, Mahila Parishad President Nurjahan Khan and Jubaida Munawar, all former students of the school, and woman leader Dr Maleka Begum were also present as special guests. Dr Sufia said students of this school have left their footprints in every sector of the country. She urged the present students to show due respect to their teachers and declared to award stipends to four to six poor and meritorious students of the school every year. Dr Maleka Begum said the school has played a great role in spreading female education through producing many scholars. Earlier, hundreds of former students carrying banners, placards and festoons brought out a colourful procession from the school premises at around 9:30am. The school has produced revolutionaries like Pritilata Waddedar, Kalpana Dutta (Joshi), Nibedita Nag and Joshanara Rahman, wife language movement hero Mahbub Ul Alam Chowdhury, authors like Moitreyi Devi and Umar Tul Fazal, politicians like Ivy Rahman and lots of other noted figures. The two-day programmes also include recollection by past students, cultural show, reception to former students, debate competition between former and present students and dance show.